I had an especially cool adventure yesterday morning – I was interviewed live on local WERA 96.7, Radio Arlington! 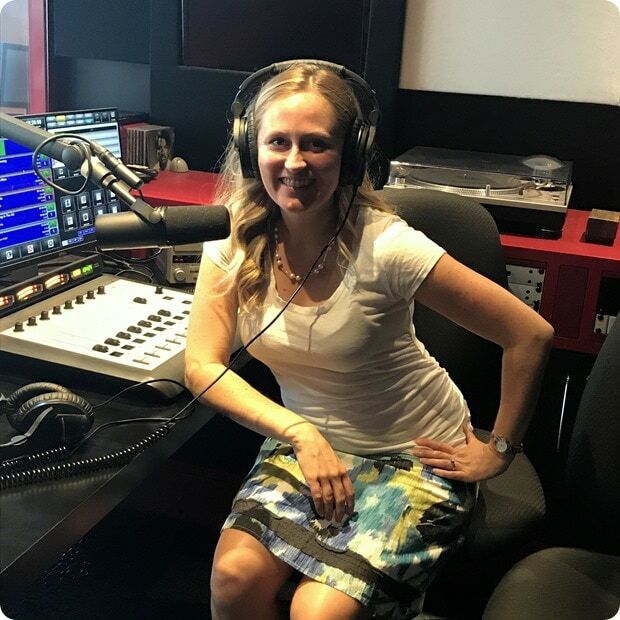 I’m a member of the local chapter of a networking group called Awesome Women Entrepreneurs, and one of the founders, Karen Bate, hosts a weekly radio show where she interviews business owners from the group. I was thrilled to be featured on the show this week! 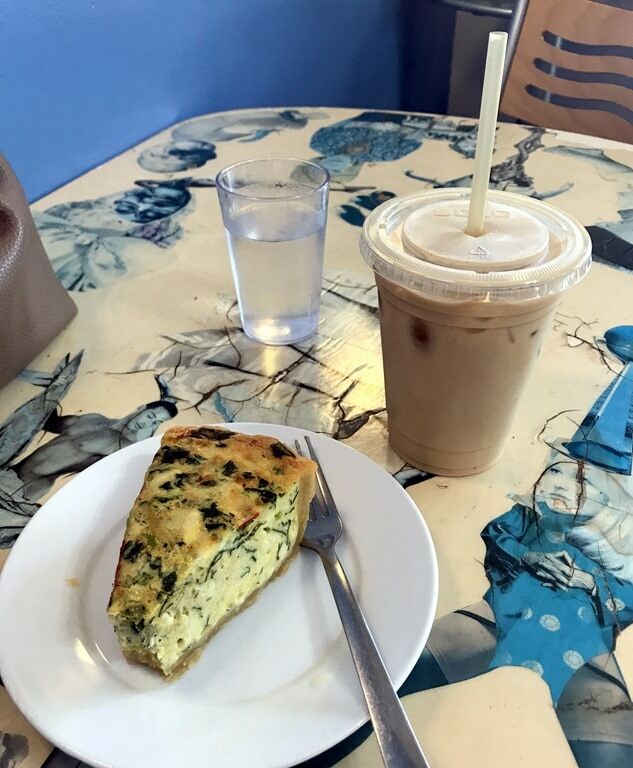 I had a bunch of errands to run after the interview and another meeting at noon, so I treated myself to a latte and a slice of quiche at Java Shack nearby to tide me over until a late second lunch at 2-ish. One of my random pregnancy cravings has been all eggs, all the time. In all forms – but I’ve been especially loving quiches and frittatas as a super satisfying mid-morning meal. 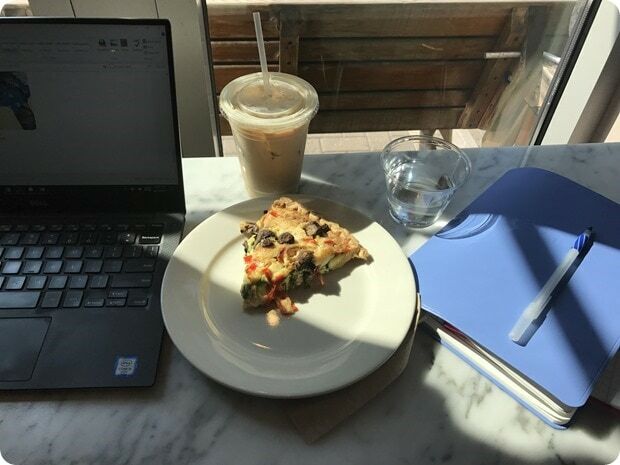 No seriously – I’m literally eating another quiche right now while I work at a different coffee shop (I had an early AnneTheRD nutrition client here this morning, so second breakfast was necessary – first breakfast was my microwave banana oatmeal with cottage cheese and some berries). I think this weekend I’m going to make one of my egg casserole/muffin recipes (either my Crustless Quiche with Spring Veggies or Scrambled Egg Muffins or Smoked Salmon & Vegetable Egg Casserole) so I am not spending so much money on second breakfasts during the workweek! Anyway! 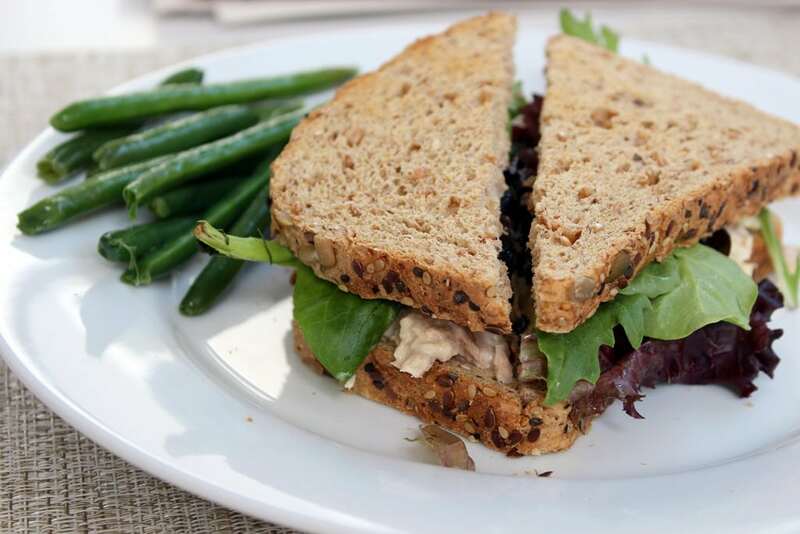 In terms of lunches, I’ve been into sandwiches this week, which makes sense since I just shared my mix & match healthy sandwich recipes post (check that post out if you missed it)! One of the highlights was a tuna salad creation made with mayo (plain Greek yogurt would also work if you prefer), dijon mustard, and artichoke hearts. I love artichoke hearts in tuna! Plus some greens on the sandwich and some leftover veg on the side, too! On the workout front, I’ve gotten in some good variety this week. 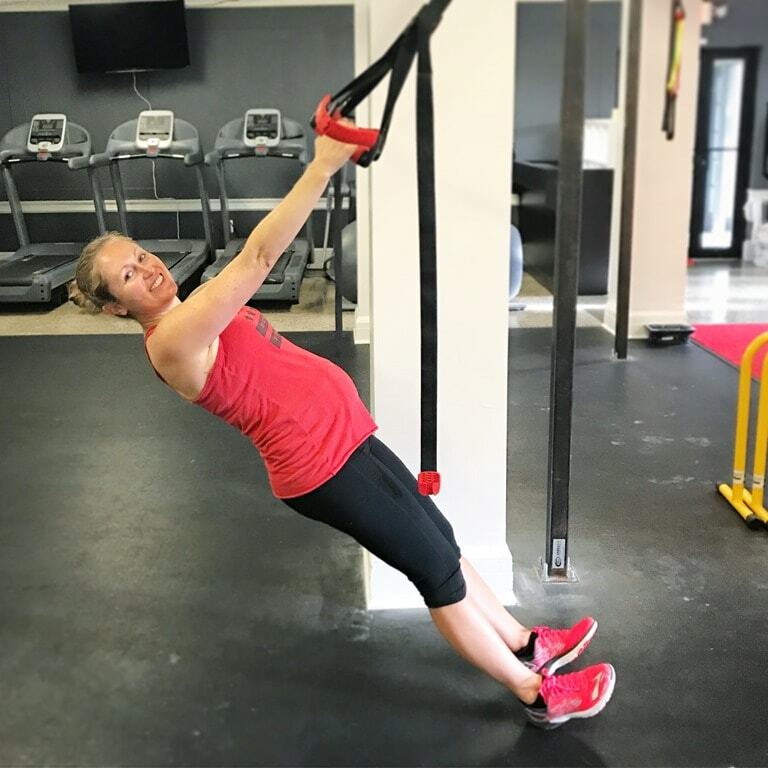 As of yesterday I’m 27 weeks, so officially in the third trimester – wow! I’m definitely slowing down a lot during these workouts and keeping the intensity low, but proud of myself for still showing up – that’s often the hardest part. Thursday: evening prenatal pilates class. I signed up for a 6 week workshop series and last night was the first class. Fun! I hadn’t done pilates in forever and obviously this is way different from normal pilates but I think it will be a great complement to the other fitness I’m doing. I met some nice women who are due around the same time as me, too! 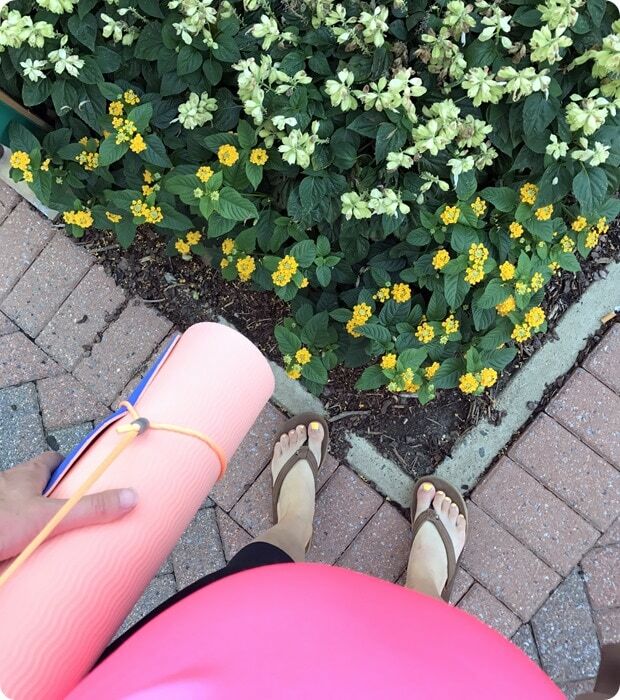 If you’re looking for a fun workout to try at home this weekend, here are two posts that caught my eye this week: Yoga Strength Total Body Workout + a round up of 30 Minute at Home Workouts (definitely bookmarking this for once the baby comes… will be useful once I’m approved for fitness again post-baby and tight on time). 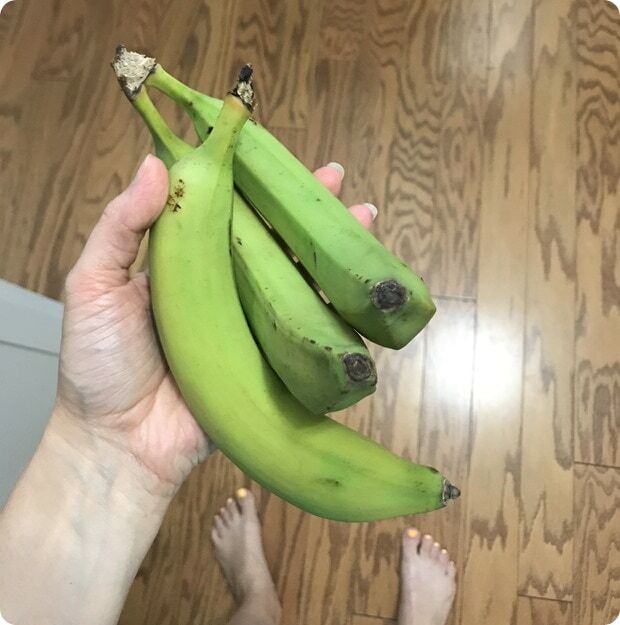 And now, I will leave you guys with this randomness: have you ever purchased green bananas that literally never got ripe?! I bought these bananas 2 weeks ago and they are still as hard as rocks. What the heck! I’ve never had this happen before – so weird! Have a great weekend, and I’ll catch you guys back here on Monday! We have a Women’s Entrepreneur group, too, that I’m so thankful for! So cool! And yes, that seems super weird about the bananas. I almost always purchase bananas green, because I really like them when they first turn yellow. Once they start getting spots on them, I tend to not like the flavor as much. I must have bought bananas from the same tree as you because I had the same thing happen! I put them in a brown paper bag for 2 weeks until they finally started to ripen, but in a weird way. The bottom part turned black while the rest was okay. So strange!!! I’m sure you have already considered this, but could those possibly be plantains that got mislabeled? That’s so weird. I’ve never heard of bananas not ripening up! I was going to suggest the same thing–that totally happened to me once at Trader Joe’s. It took me about a week to realize, and then I took them back and they let me swap them out for real bananas. I actually didn’t consider that – hmmmm! Great interview!! So fun to hear more from you this way! My husband bought a bunch of organic bananas last month that never got ripe! Bananas are something I typically don’t buy organic, so I was wondering if that could have had anything to do with it? These were organic… but I’ve bought organic bananas before and never had this problem! So strange. I had that happen once with bananas, so weird! I have no idea why. Hi from Chapel Hill! I wanted to link you to an awesome quiche recipe that I found on pinterest that uses a sweet potato crust! It is SO good! On another note, I have had bananas like that once before. I got them at a race, and couldn’t eat them after I finished running for obvious reasons! They literally took 3 weeks to be edible. So weird! Ooo awesome – that sounds delicious!! I’ve had that happen with bananas, but only the organic variety for some reason! Village Sweet Bakery in Westover has really yummy quiche! Ooo I’ll have to continue my quiche tour of DC/Arlington and check it out!! Well done on the interview! Way to go on your boot camp! I also ate so many eggs while I was pregnant. My fave was cheese omelets … I probably ate one a day starting in my second trimester :). During my food service rotation, a chef told me that he often inspects the bananas being delivered because if they are too green they will never ripen… must be something with the ripening enzyme. Maybe it doesn’t become activated if the banana is picked too early?